In a few places in the mathcw library, we need to work with an intermediate precision having at least twice as many digits as storage precision. 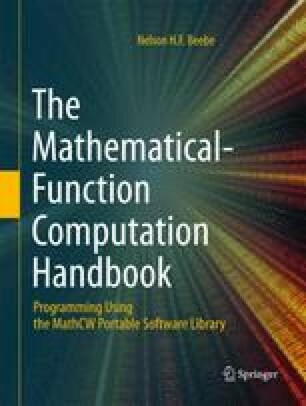 In almost all historical floating-point architectures, for single-precision computation, the double-precision format satisfies that requirement (see Table H.1 on page 948). However, for double-precision work, higher precision may be unavailable, as is the case in many programming languages, or it may be insufficiently precise, such as the IEEE 754 80-bit format compared to the 64-bit format. The computation of a*b - c*d in Java will produce the same result everywhere, but it may be the same very wrong result everywhere! — Fred G. Gustavson, José E. Moreira and Robert F. Enenkel (1999).